According to new data released by the Government and analysed by the National Housing Federation In Tameside 2,457 households were hit by the bedroom tax in August and , the first to show actual numbers affected by the controversial policy, in Tameside the Average amount of Housing Benefit lost per year was £731.90. “The Government says discretionary housing payments will help those who cannot downsize, but there isn’t anywhere near enough money to go round. said: “These figures show the extent to which this government is affecting the lives of ordinary people. It’s astonishing that a government can tax people for having a spare room when there simply aren’t enough smaller houses to move into while at the same time cutting taxes for high earners. 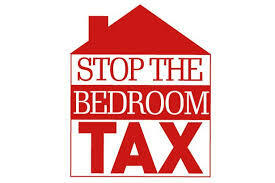 A full breakdown of Bedroom Tax figures for all local authorities is available here. This entry was posted in Campaigns, Tameside Green Party and tagged Green MEP, Green Party, Green Party MEP keith Taylor, National Housing Federation, North West, Tameside by tamesidegreens. Bookmark the permalink.